Dale taught for many years at The American Academy of Art in Chicago. Currently, he teaches at the prestigious Palette & Chisel Academy of Fine Arts in Chicago, esteem Mainstreet Art Center in Lake Zurich, IL, Elmhurst Art Museum, Elmhurst, IL, workshops and in his own studio. 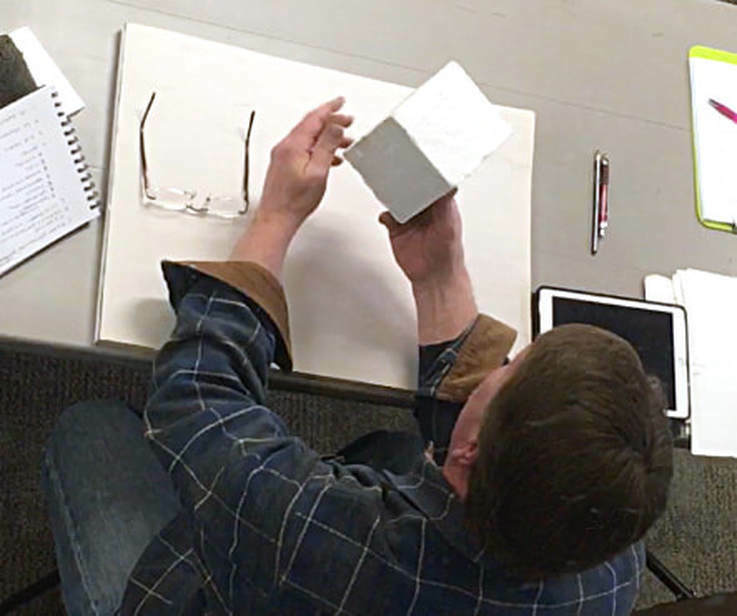 Through his 40+ years of professional teaching drawing and painting techniques and skills, Dale has taught over 2000 students – mentoring many who are now successful, accomplished artists. Chicago's oldest art academy featuring fine art classes in oil painting, watercolor, life drawing and sculpture.. Formed over a century ago to enable students, illustrators and fine artists to spend more time working from live models, a few artists’ dreams became the Palette & Chisel Club.. Their founding principles remain our guiding mission. Today’s Palette & Chisel is a non-profit organization. Since 1921, they have been housed in a beautiful circa 1870’s mansion in the heart of Chicago’s famed Gold Coast. This esteem school #MainstreetArtCenter offers fine art classes in drawing and painting for artists of all ages and levels of experience. Open since 1994, Mainstreet attracts students from all over the Chicagoland area, Rockford and southern Wisconsin. Their instructors have professional careers as artists, exhibit in galleries throughout the country, teach workshops and appear in artists publications. If you have any questions regarding this class please contact me. I'd would be happy to discuss your future in watercolor. This class is held in his personal studio in Highland, IN and is geared towards the individual based on his or her skills. All the basics will be covered from value sketches, how to use a photo reference properly to painting your watercolor. Materials and application of watercolor will be discussed. There will be demos and personal guidance along the way. 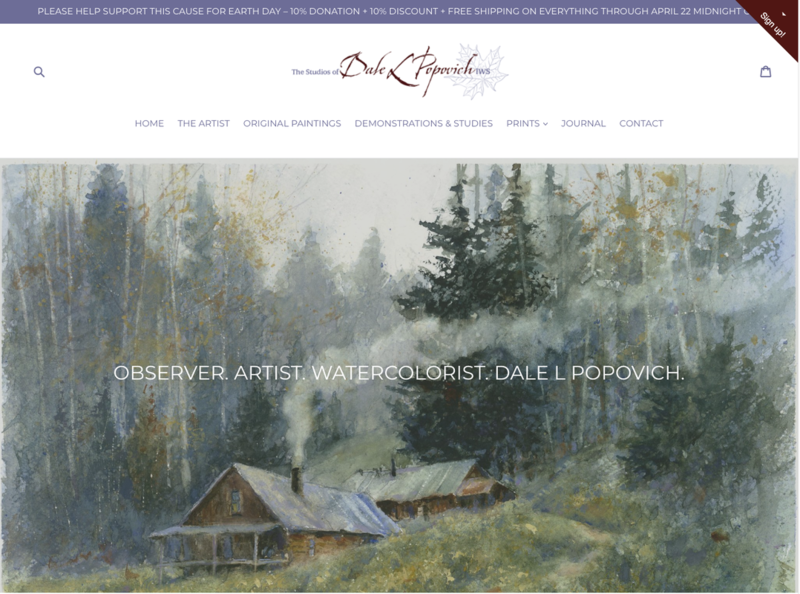 To learn more about drawing and painting techniques and skills in his studio please drop him an e-mail at Dale@DalePopovich.com or call (219) 838-8645. Do you feel you have hit a creative wall and need some guidance? Or maybe you need help implementing key concepts and drawing skills, watercolor painting techniques. Let Dale give you personal one-on-one instruction. To learn more about private instruction please drop him an e-mail at Dale@DalePopovich.com or call (219) 838-8645. 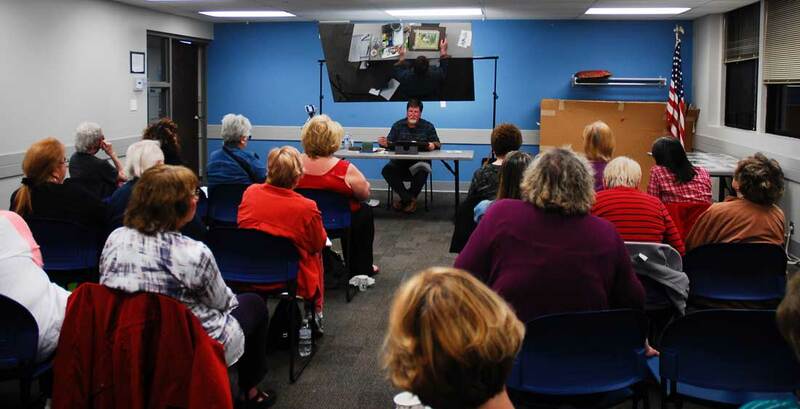 Have you ever wished I could bring my instruction to you and your group on a bi-monthly or monthly bases? To learn more about private instruction for your group please drop him an e-mail at Dale@DalePopovich.com or call (219) 838-8645. ​CLICK HERE for my latest workshops and demos. ​WORKSHOPS & DEMOS​ You can also sign up for my newsletter for the latest updates..
​Full-day Watercolor Workshop for LOLA, Land 'O Lakes, WI. I spent the morning painting, demonstrating elements of nature, sky, water moving and still, rocks, handling trees, and different ways of creating textures. Basic drawing and value lecture/demo at the Town & Country Art League, Palos Heights, IL I took this group through a lecture on basic drawing and value which is the core of any solid 2-dimensional art. I wrapped up the two-hour lecture/discussion with a small watercolor demo implementing the elements covered in the earlier part of the lecture. Two-Full days watercolor workshop at the Peninsula School of Art in Door County, WI. 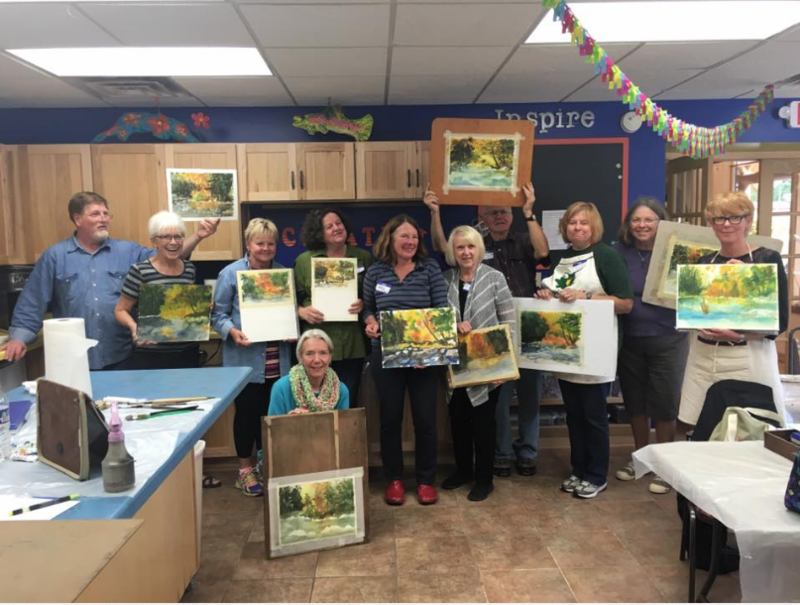 Here's what one student said about the workshop – "I just wanted to say again how much I enjoyed your watercolor workshop this weekend in Fish Creek, WI. I learned a lot and appreciated your personable and easy-going style. I also was impressed with the way your critiqued our work, constructive and encouraging. It really helped me to think of ways I can improve my landscape painting." 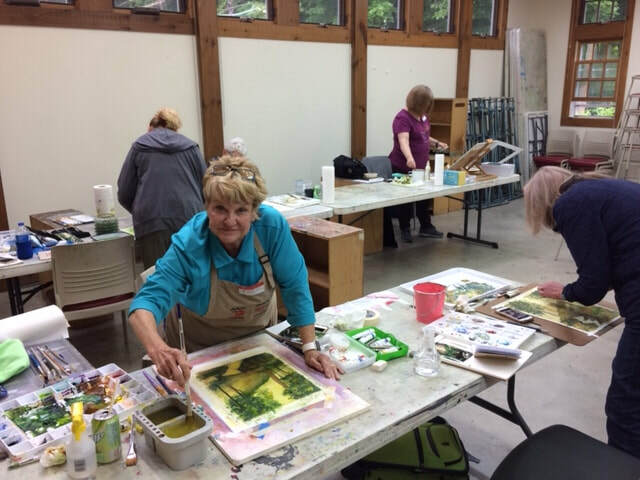 Full-Day Watercolor Workshop in Dixon, IL. I spent the day of painting with these watercolorist sharing my personal vision of “Into the Wood.” I did two demos in the morning sharing my watercolor knowledge. In the afternoon we did a paint-along of a snowy Wisconsin River. Full-day workshop for the Lakeland Art League in Minocqua, WI. I did two demos showing the group how to paint snow and trees in watercolor. The afternoon demo was a paint-along. There are three phases-I demo and then let my students recreate what I painted. I then demo the second phase and let them recreate that stage. Finally I paint phase three completing the painting. The students also walk away with a completed watercolor. I find my students understand the process much faster this way. At the end I raffle the demos.